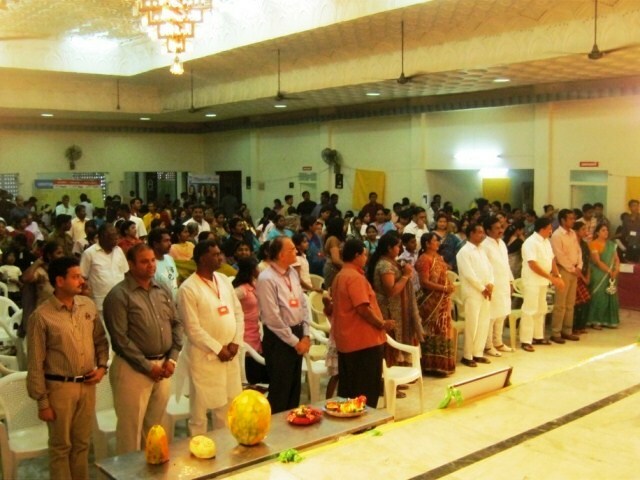 EGL is an annual programme, specially designed for NRI volunteers/donors/office bearers of Ekal Movement. The event is also joined by many keen learners of home chapters of Ekal also. In EGL programme the team gets to know many intricacies and intriguing facts of Ekal working system on the ground level. It is in fact “on the spot learning” in live conditions. EGL is extremely beneficial for whoever is keen to understand the Ekal system. It particularly helps the office bearers of Ekal units to understand first and then answer the related questions regarding Ekal works and its impacts on the villages. 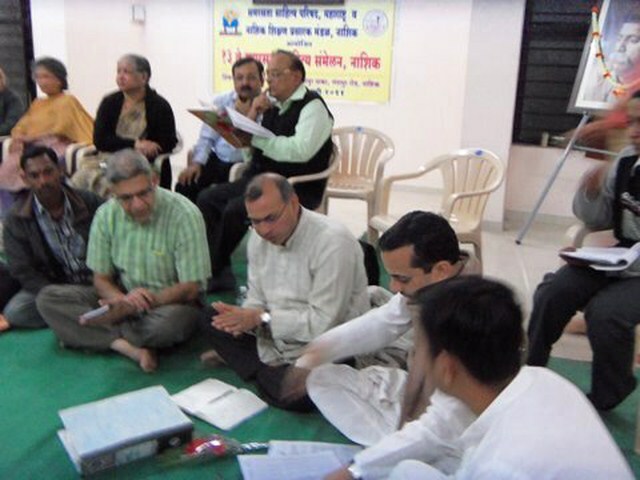 The fifth EGL started from Pune (Maharashtra) on 3rd Jan and concluded in Surat (Gujarat) on 7th Jan, 2011. Sri Ramesh Shah, Chairman EVFUSA, his wife Kokila Ben, Dr. Hansmukh Shah, President Chicago Region, his wife Joytsna Ben, Sri G.K. Goyal noted industrialist and Vice-President of BLSP Lucknow Chapter, his wife Adarsh, Sri Naresh Jain, National President BLSP, his son Yatin, a third year student of engineering, Sri Anil Mansingka, C.A, the Youth Prabhari of Shrihari Satsang Samiti, Mumbai, Sri Anshuman Lath, young engineer and entrepreneur from Pune and Sri Vivek Karvir, industrialist and President of SVO of Ekal Maharshtra, made the high profile EGL group. They were accompanied by Sri Ganesh Shenoy, Sah-Abiyan Pramukh of Ekal Movement and Prof. Manjushree as organizer and guide of the EGL. • In four Ekal Villages (Matardane, Ranghar, Pimpoorna and Dibos: two in Bimashankar Anchal and two in Trambakeshwar Anchal), participants saw and participated in Ekal Schools Gram Samiti, Sanskar Shiksha and its impact, plantation by Ekal children, organic manure pit by Acharya, Mahila Sangathan, Gram Samiti meeting, Satsanga, traditional folk dance by tribal brethren and dinner with villagers. • Anchal Vyavstha Varg at Nashik Anchal - The EGL group was thrilled to meet the Anchal Samiti which is the only all women committee headed by Smt. Manjusha Dahale in the country. The local educated ladies of the committee visit their designated cluster (Sanch of 30 villages) and monitor quality aspects of training of the teachers. They also scrutinize all formats of MAR and MWR. Sri Ramesh Bhai and Sri G.K. Goyal looked into all the MAR and MWR papers to be assured of their understanding. • Half yearly Abhyas Varg (Teacher Training) at Harshul Sankul Centre - There were thirty teachers and their trainees showed how to run “Weekly Pathshala” where these village Ekal teachers have to educate parents and villagers in Arogya and Gram Vikas schemes. The trainer taught them how to prepare ORS and give to patients of diarrhoea in emergency. Most of the teachers (male and female) were class X & XII passed. • Sustenance of the full time volunteers was remarkable - The EGL group freely interacted with full timers in three places - Nashik Anchal, Harshul Sankul and Ranghar Village. It was a pleasant experience to know that 99% of full timers have progressed and were promoted from Acharya (teacher) to Upsanch to Sanch-Sankul and then Anchal (Distt. level) Karyakartas. They have been associated actively with Ekal for 8 to 12 years. • Aadi Jyotirlinga at Bimashankar and Trambkeshwar was also visited by the team. • Ekal students had stolen the heart of EGL - They responded, showed yoga, sang patriotic songs, narrated stories and recited poems. Two of them, a girl and a boy at the village Matardane showed remarkable skill and confidence while performing two experiments. The small girl showed how to clean the water by traditional method of using pitchers. The boy lighted the candle and then covered it with a glass. The candle was blown off. He then asked with masterly skill “if a candle can not survive without oxygen, how can we survive? So we should take care of our mother nature and do not allow pollution.” “Their teacher Smt. Nanda Tai was very good and remarkable,” said Ramesh Bhai. • 90% Villagers turned Malakari in Ranghar village - 90% villagers have become ‘Malakari’ due to regular Satsanga and Sanskar Shiksha. They wore Tulsi Mala and do not booze and eat non-veg food. This practice has benefited them enormously. There is considerable decline in conflicts over petty things in the village. Their general health conditions have improved due to cleanliness. • Plantation by Ekal Children in Pimpoorna Village - Each child has planted 5 trees of Mango and Cashew nuts. The kids showed their saplings proudly to each one of the EGL group member. • Kavita Rout (The Vanvasi girl of Harsul Maharashtra) is the Medal holder of CWG in Delhi and Asiad. She is from the Ekal Village. The little Kavita was admitted to a girls hostel of Harsul Taluka (Sankul centre). There she was given attention, care, special training by patron Smt. Lalita Tai. “There is no dearth of talent in our tribal children. They have genetic superiority.” Mr. Rahul Rathi young President of Pune chapter told us. He is a dynamic software engineer and entrepreneur. • Ekal student becomes the best teacher of the Govt. School - Sri Janardan, studied at Ekal school of Harshul Sankul area. Worked as teacher (Acharya) and Up-Sanch Pramukh for some years. Then encouraged by the seniors, he studied further upto BA. B.Ed. and finally became teacher of Govt. School. He won the award for best teacher of the area because he followed the same pattern of teaching what he had learned all through his association with Ekal. He came to meet the EGL team. • Knowledge working at Jawahar Sankul - The EGL group was given an opportunity to see presentation by 5 NGOs. BAIF Pragati Pratisthan, Mittra, Samartha and Vayam (We). The spokespersons, themselves researchers showed some brilliant aspects of Rural Agriculture, leadership development, man making, preserving indigenous traits of tribals and their their products etc. It is always good to know more of the subject and get benefits of researches in due course of time. In totality the EGL was very inspiring and enlightening for all the members. Adim Jati Kalyan Vibhag of the Government of Madhya Pradesh has established Thakkar Bapa Rashtriya Samman since 2008. This samman is being awarded to any society or organization who are rendering valuable service for promotion of self-request, education, healthcare and economic development of the backward Janjati community, under this samman a sum of Rs.2 Lacs with a Memento and a Citation is presented. The Adim Jati Kalyan Vibhag has instituted a selection committee which goes into the details of the working of various societies/institutions who are working for the all-round upliftment of the Janjati (tribals). 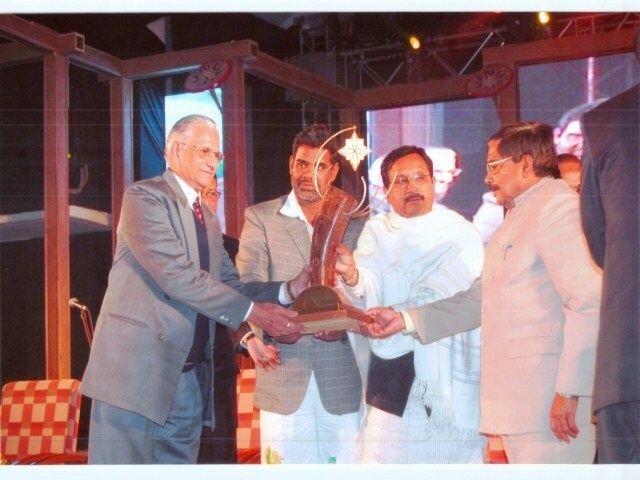 The committee has selected the name of the Friends of Tribals Society for awarding this samman for the year 2009. 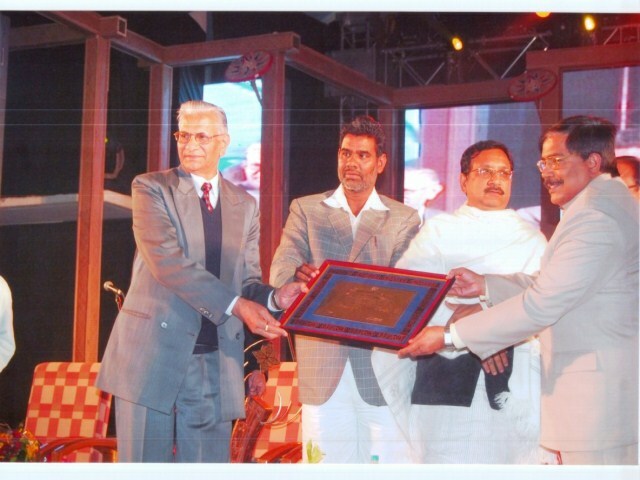 The award was presented on the 11th January, 2011 in a grant function organized in this respect at Rabindra Nath Tagore Auditorium in which about 700 citizens of Bhopal were present. The award was presented by Sri Kunwar Vijay Sha, Minister of Adim Jati & Anusuchi Janjati welfare Minister & Sri Hari Shankar Khatik, Rajyamantri of Adim Jati & Anusuchi Janjati welfare Government of Madhya Pradesh which was received by Sri M.L. Jain, All India Ekal Abhiyan Prabhari of Ekal Movementn on behalf of the Friends of Tribals Society. Friends of Tribals Society in true sense has taken up the task to remove illiteracy from the children living in remote villages from Kashmir to Kanyakumari and from Manipur to Gujrat, covering as many as 34,343 villages and over 1 million children. The ladies of FTS Mahila Samiti Erode Chapter & Lions Club of Erode Sangini (club with only ladies members) have united to serve the Children of India. 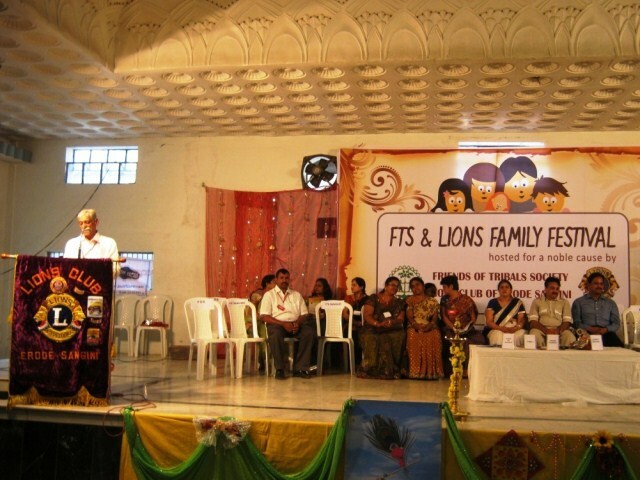 Friends of Tribals Society and Lions Club of Erode Sangini conducted a fun fair exhibition for the first time in the history of Erode to raise the awareness for the education of tribal children on 8th & 9th Jan 2011 Saturday and Sunday at Devi Mahal, Bhavani Road, Erode. The highlight of the program was lots of fun filled competitions, variety stalls for shopping, food stalls for taste buds, games for recreation, raffle ticket prizes & cultural programs etc for these 2 days. Attractive part of the program was Ekal Children’s vibrant folk cultural events. They came all the way from remote parts of Thalavadi, Theni and Dindigul. More than 100 Ekal fulltime workers participated as a volunteer to success this fun fair. In this fair more than 75 stalls exhibited all kinds of goods from all over India and more than 4000 people visited the Fun Fair in these two days. Finally it was a grant success which would enable to give education to many India’s forgotten children. 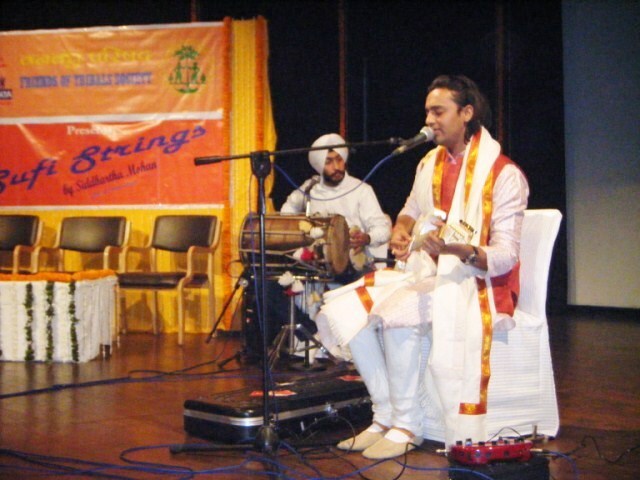 *Sufi Strings* programme by a famous Art of Living singer Sri Siddhartha Mohan was organised on 9th Jan.,2011 in Chinmaya Mission, Lodi Road, New Delhi by FTS, Delhi Chapter. In spite of cold wave, around 300 persons attended the function. Smt. Urmila Lohia, wife of Sri O.P Lohia, industrialist and CMD of Indo Rama Synthetics India Ltd., graced the occasion as Chief Guest. Sri Vijay Maroo, President, EVFI gave a presentation of EVFI activities. Sri Brahm Ratna Aggarwal, Vice-President EVFUSA gave an impressive talk about Ekal mission. 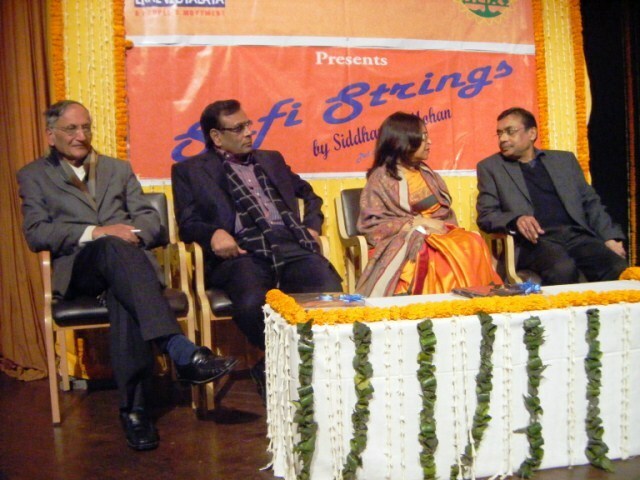 Sri Siddharth Mohan presented heart touching 'Sufi Sangeet' which was greatly appreciated and applauded by one and all. 52 visitors form Raigarh visited Ekal Vidyalaya of Dokri Pahari village in Raigarh Anchal of Chhattisgarh State on 26th Dec., 2010. 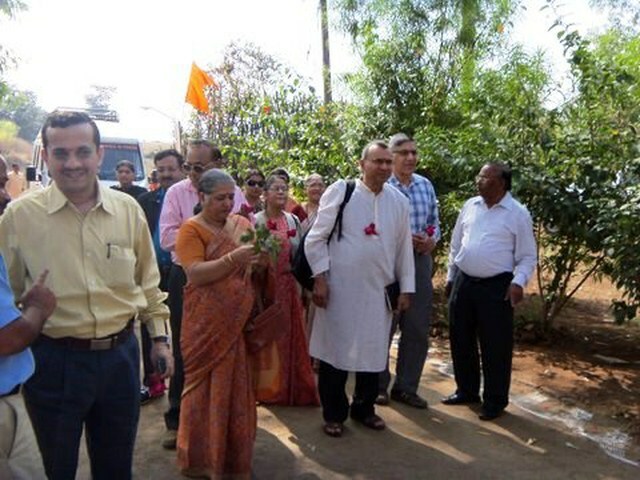 The group of visitors departed from hotel Ashirwad in the morning under the guidance of Sri Vinod Agarwal, Anchal Pramukh, Raigarh Anchal. First of all, the visitors had the glimpse of Ma Banjari. After that they reached Dokri Pahari village via Gharghauda, Khari Pahar, Kaya, Kamtara. The villagers welcomed them according to the traditional culture by putting Tilak on their forehead. The villagers took the visitors to Ekal Vidyalaya playing the drums. There were 42 students and one teacher in the school. The procedure and curriculum of teaching was explained to the visitors. The visitors talked to the students. The students recited alphabets and poems to the visitors. They also told stories and sang songs. All the visitors felt gratefulness to Friends of Tribals Society. The people of Raigarh complimented this work of basic education. After visiting the school all had breakfast hosted by the villagers. All were happy to visit the Ekal School. The villagers also told their problems to the visitor. They told them that there is no road and electricity in the village. The visitors promised them that they shall talk to the MLA and other concerned authorities of that area about road and electricity problem. The visitors distributed bags, sweets and chocolates to the students. Sri Prahlad Seth promised to sponsor 5 Ekal Vidyalayas. Some others also promised to sponsor the Ekal Schools. A team of four members from The Coimbatore Sindhi Panchayath Association namely Sri Gobind C.Subnani, President, Sri Rathan J.Radhakrishnani, Secretary, Sri Harishchander G.Kripalani, Treasurer, Sri. Ramesh L.Shivnani, Committee Member visited Ekal Vidyalaya of Kaaliyur in Ooty Anchal on 27.12.10. 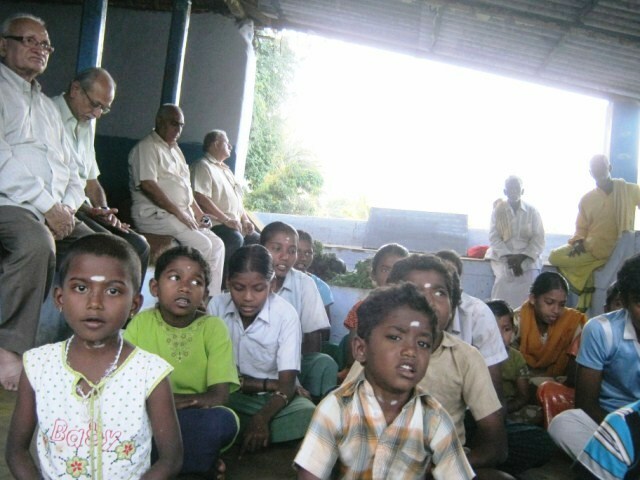 All the vanayatris were welcomed by Ekal children when they entered in the village. Kum. Saritha (Siksha Prasikshan, Ooty Anchal) explained about the functioning of Ekal School. The visitors very happily talked with the children which was a motivating factor for the children to achieve their goals. At the end they distributed sweets and biscuits to the children. Also the villagers (Village Samithi) gave them tea and snacks with love. “Our visit to this Friends of Tribals Society – Ekal School is an eye-opener to our members of Sindu Sadan. I request more members to come forward to see these things in our society and help and co-ordinate specially the ladies and youngsters of our prestigious association. We are thankful to Mr.Kanagaraj, Chief Co-ordinator and Friends of Tribals Society.” Mr. Harish Chander G.Kripalani told.